Did you hear? BlogPaws interviewed Glogirly yesterday and they've just published the whole thing on their website. Click HERE to check it out. You can even leave a comment on the article and make those DOGS jealous that us cats always have each others backs. We're cool and we know it. BlogPaws wanted to know more about ME and MY blog. And MY winning tee shirt design. Like any celebrity worth their weight in salmon, I declined to comment. That is, after all, what I have *people* for. The interviewer referred to Glogirly as my Mom. Mom? Seriously? Everyone knows she's my Girl. Glogirly did a pretty good job, although I don't feel she represented my true beauty and intellect in her answers. It probably wasn't HER fault. I hear the interviewer was a real dog. They at least managed to include this ONE photo of me. I was hoping for a few ::dozen:: more. You two are getting more and more famous all the time! ConCATulations Katie and Glogirly ! You two are sooo the right winner ! Well done, Katie and your Girl! We think Glogirly did a good job answering all those questions. Congratulation son the article. I'm on my way over to read it. Concatulations again! I'm so bummed that TW won't go and meet you but I'm glad she'll be home waiting on me paw and tail. That was a great interview, considering it did not focus enough on you, Katie! 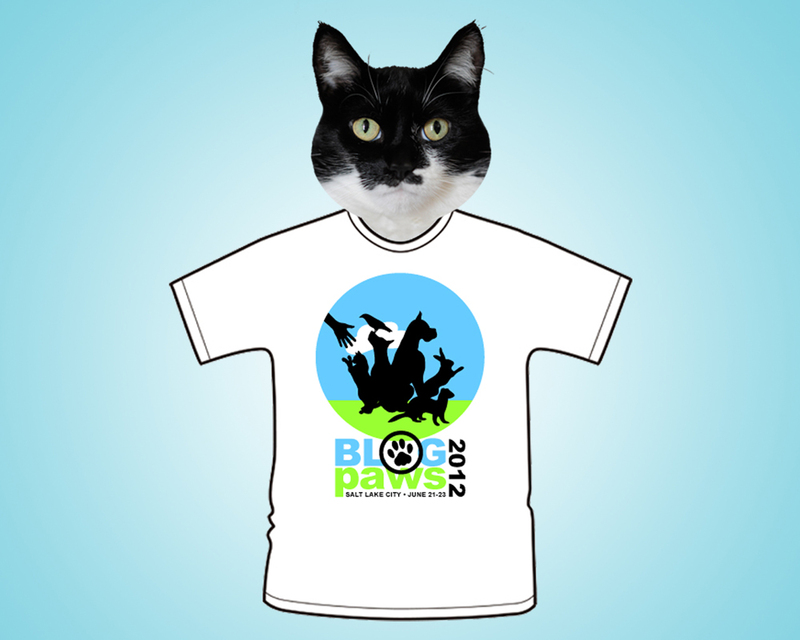 My human can't wait to meet your human in person at Blogpaws! How exciting! You've become such a celebrity! But really, they should unnerstand that the "Mom" is really only a secretary or "Girl Friday"! HaHaMeow! We saw it! And you know I'm a little bit worried at how good you look in the t-shirt. You might be forced to wear one for real! Congratulations! Love the picture! I agree they should have used a few dozen more. The shirt looks great. 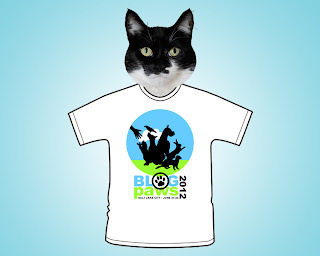 I'm heading over to check out the BlogPaws interview with your "Girl". Bravo! We think you both do an excellent job! What a great interview. I wish you could've talked too, Katie. The Humans do the best they can...but they're just not QUITE in our league, are they? Congratulations! it's so cool that you won! 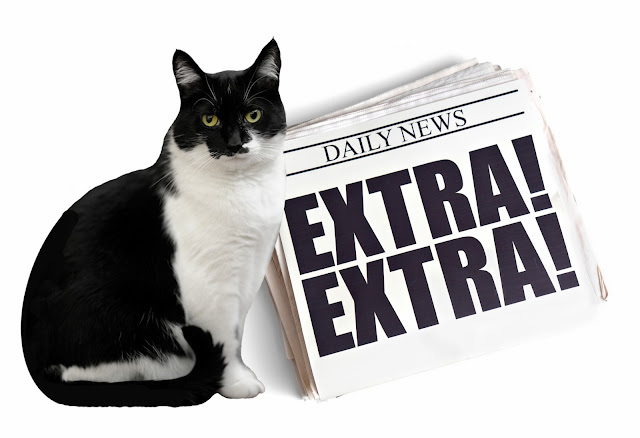 Concats on winning - have had a look at Blogpaws. Also my son is interested in astronomy and likes your "Outa This World" picture. Wow! Concats on the interview! We like to see CB friends' stars shine! Wow Katie you and your Girl are doing marvelous pretty soon you will be a household name. Congratulations!!!!!!! I thought it was a great interview, and I love the final t-shirt design. You and your "girl" are both very talented, MOL. I think your "Mom" did great---OK, so she did not talk ALL about you, yet Glogirly talked about all us kitties and all. Congrats again about the t-shirt! !